Using a ladder in place of a towel rack is an obvious variation in décor. It is a quick and easy way to add an interest factor if your space can accommodate it. Here are a variety of examples to inspire you. First up is from West Elm. This can be achieved with no DIY skills at all. The ladder is available from the store. I love it coupled with the stump stool and the combination of natural wood with the gray and white. The next application is definitely a DIY project using a vintage ladder hanging in the ceiling. 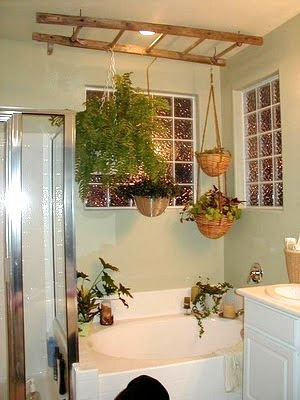 This one is unique because the purpose is not a towel rack but instead a solution for hanging plants. I bet the plants love the humidity! Below is a different approach to storing towels on the ladder. 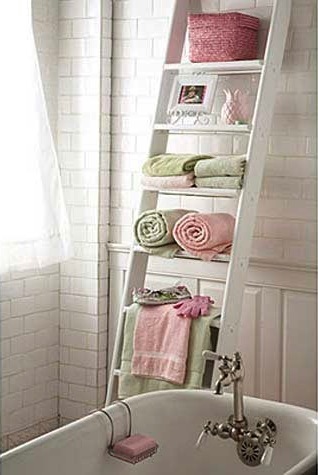 It is not being used as a towel rack but more as replacement for shelves. It is a nice aarrangement of colors and shapes. 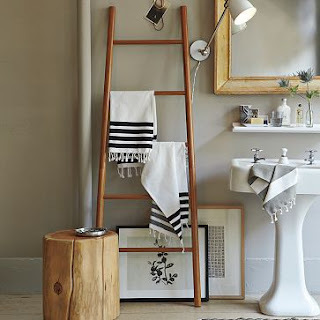 Below is a decidedly handcrafted ladder made from weathered wood bringing a touch of the outdoors into this bathroom. 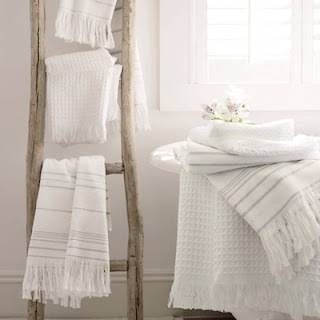 Change the function of the ladder by also hanging vintage wire baskets from it as shown below. 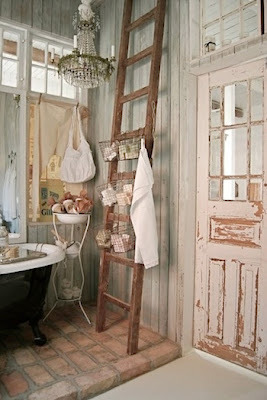 Love the ladder but I am not sure about the glass window in the bathroom door! Next is a beautiful blending of a contemporary bathroom with a bamboo ladder. The ladder absolutely softens the impact. The ladder traditionally is thought of as a fixture in country décor but it works in contemporary and Asian influenced design just as well. 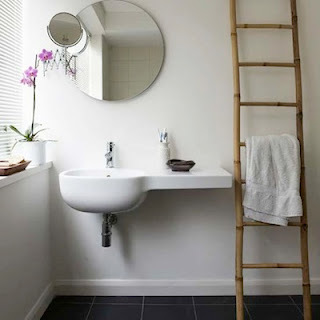 All wonderful ladder ideas. I just need the space for one.